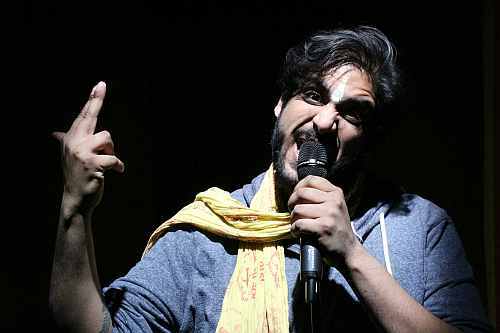 Toronto’s Theatre Passe Muraille presents Jivesh Parasram’s new solo show Take d Milk, Nah? As we were heading to Theatre Passe Muraille on Thursday evening to see the opening of Jivesh Parasram’s solo show Take d Milk, Nah?, my friend Elaine commented that she wasn’t sure that she had been to Passe Muraille before. As I was about to say that she would recognize it we turned the corner and saw a huge inflated cow next to the theatre. There’s no way you can miss it. Which is good because you don’t want to miss Parasram’s show. Parts of it will make you laugh, parts of it will make you think, and, if you’re a white Canadian, parts of it may horrify you. Elaine and I both enjoyed it although we both had the same quibble. More about that later. Although there was no intermission the show was in two distinctly different parts. It actually felt like two different shows. Parasram wrote and performed the show and opened by describing it as an “identity play”, not a term I had heard before. He described it as a play where the protagonist discovers a conflict within themself and seeks to resolve it through the play. He performed a short piece to demonstrate. It was screamingly funny. I realized that I’ve seen those plays and that I’ll never be able to see another one without remembering Parasram’s parody. I was actually surprised that the show had started without the acknowledgement that we were on traditional lands of Indigenous people. Parasram worked the acknowledgement and thanks into his play in a lovely, natural way after his intro about identity plays. Parasram has a lot of identities to explore. He’s Canadian, and Indian, and Hindu, and West Indian, and Trinidadian. In the first half of the show Parasram told stories about visiting Trinidad as a child and wanting to be ‘proper third world’. He talked about Hindus’ love of cows and their belief that cows are family. And about his experience trying to help a cow give birth. He told us about his great-grandfather going to Trinidad as an indentured servant. And about Indian history. His timing was great, his presentation was loose and funny, he had the audience in the palm of his hand. The second part of the show was very different. In the first part Parasram wore street clothes. In the second part set and costume designer Anahita Dehbonehie clothed him in a gorgeous white sherwani with black markings that looked like cow skin. There was a big difference in the set as well. For the first part Dehbonehie made the stage into an fairly small alcove using red and yellow fabric panels. Rebecca Vandevelde’s lighting made it glow. There was a small altar table at the back of the alcove. Very simple and quite lovely. For the second part the stage was full size with nothing on the walls and the lighting was more dramatic. The altar table was was still in the same place but looked as if it was closer to the front. Parasram’s presentation was also very different. More dramatic, more serious. Elaine felt that it started to feel ‘lecturey’. I thought it verged on didactic, something I’m not fond of. I like more sugar in my milk. His content was interesting. We both enjoyed learning more about Hinduism and hearing Hindu folktales. it was fascinating to watch him performing rituals at the altar. I was horrified by his story about what his teachers and his school did to him after 9/11. He talked about living in margins and not letting it poison you, to remember that you always have choices; that borders are an illusion we put up to protect ourselves. As I think about it, it seems to me that he was offering comfort as much as advice. Parasram is a wonderful storyteller and his story is engaging. Even with our quibble we both enjoyed Take d Milk, Nah? and think it’s worth seeing.